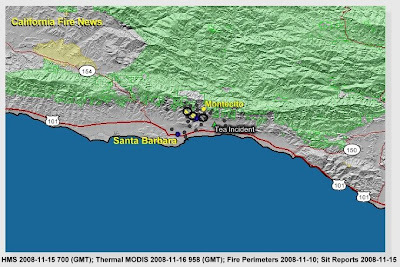 Fire Progression: Minimal Movement expected; potential movement to the west toward Mission Canyon Road in the Santa Barbara area. An eastward spread towards Hot Springs Rd. in the Montecito area due to wind is possible. Start Date/Time: November 13, 2008 at 6:30 p.m.
Fire behavior: Fire is burning with the Santa Anas to the Southwest. Incident Command Organization: Unified: Montecito Fire District, Santa Barbara City Fire, Santa Barbara County, Los Padres Forest, Cal Fire. Acreage and Containment: This fire has burned 1,940 and is 75 percent contained. Structures Destroyed and Property Damaged: The fire has destroyed over 111 homes, and damaged 9 residential structures. 1500 residents remain threatened. Resources: 2,235 firefighters and overhead personnel are assigned to this incident under unified command.There were 9 helicopters assigned to the fire on Saturday, no fixed wing aircraft, hundreds of engines and multiple strike teams assigned to the Tea Incident. Injuries: Two civilians have been injured. Two additional minor injuries reported today. WATER EMERGENCY: Due to the firefighting activities in the area, water reservoirs have dropped to critically low levels. We strongly encourage ALL residents in the Montecito and Santa Barbara communities to limit their use of water during this emergency to allow the most efficient use of water for firefighting tactics. Evacuations and Road Closures: Evacuations and road closures remain in effect for the west portion of Montecito and portions of Santa Barbara. Incident Command Team 10 and Law Enforcement are working on a plan toallow residents affected by the fire back into their respective property. East Mountain Drive east of Cold Springs Rd. Sycamore Canyon Rd. east from Chelham Wy. Barker Pass Road from APS to Sycamore Canyon Rd. APS from 5 points to Barker Pass Rd. Loma Media open from APS to Las Alturas Rd. El Cielito north of Stanwood. Mountain Dr. west of El Cielito. Mt. Calvary Rd is closed at El Cielito. Las Canoas east of Las Canoas Place. NOTE: Sycamore Canyon at 5 points up to slide area is open to residents only. NOTE: Las Alturas remains closed from APS to Conejo Rd. NOTE: Gibraltar Road is closed at El Cielito. EASTERN BOUNDARY: Cold Springs Rd. between Sycamore Canyon Rd. and East Mountain Dr.
Canon View Rd. at Sierra Vista Rd. Loma Media at Los Alturas Rd. Las Alturas Rd. at Conejo Rd. Stanwood Dr. at Mission Ridge Rd. Stanwood Dr. at El Cielito Rd. Mountain Dr. at El Cielito. Gibraltar Rd. East at El Cielito Rd. Mt. Calvary Rd. at El Cielito Rd. Road closures: Link - This page is updated every three minutes with road closure information. Bob, just wanted to thankyou for keeping this firefighter's mom a little more informed.Great job. Your welcome, I got to keep the Firefighter mom's happy!